The Seymour Duncan SSL-3T-Rw/Rp is a dual output true single-coil pickup for warm instruments. The tapped portion has a bit more than half the output as in full output mode. 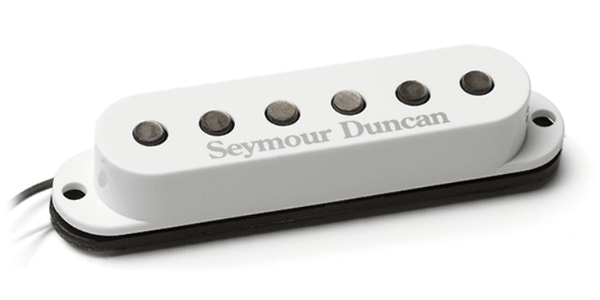 In full output mode it is Seymour Duncan's hottest traditional single coil Strat® pickup. Recommended for country, pop, blues, classic rock and heavy rock. This version is Reverse Wound / Reverse Polarity which is intended to installed in the middle position for hum cancelling capabilities on a Strat® when the 5-way switch in in positions 2 and 4. This is the next step up from the SSL-5 with more sustain, fullness, and output - and less treble response. The raised flat Alnico 5 pole pieces are taller for a stronger and deeper magnetic field. Extra coil windings provide extra power making this pickup great for heavier music styles. White cover included. Many players use an SSL-3 in the bridge position with vintage output pickups, like SSL-2's, in the neck and middle for tonal versatility. For heavier and brighter-toned instruments with ash or alder bodies. Works well with maple or rosewood fingerboards.